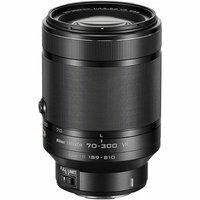 The Nikon 70-300mm f/4.505.6 VR1 Nikkor Lens is a compact and lightweight telephoto zoom lens with Vibration Reduction (VR) and Nikon 1 mount. The 70-300mm focal length offers an angle of view equivalent to 189-810mm in 35mm format and is designed as a super-telephoto lens suited to capture distant subjects, including wildlife, landscapes, motor sports, people and more. The VR mechanism effectively reduces the effects of camera shake equivalent to a 4.0-stop increase in shutter speed at the maximum telephoto position and 4.5-stops at the maximum wide-angle position. The lens also sports Nano Crystal Coat which effectively reduces ghost and glare, a focus ring for making fine, intuitive adjustments, and a focus limit (Full/Limit) switch, which enables quick focusing on distant subjects by restricting focus distance to greater distances.